As we head toward the Spring Equinox this week, it’s a good time to update boxing’s pound-for-pound top 10. No. 10: Errol Spence Jr., IBF Welterweight Champion For me, this spot was nearly a toss-up between Spence and fellow welterweight belt holder Keith Thurman. I gave the edge to Spence, because I feel his stoppage of Kell Brook is more impressive than any of Thurman’s best wins. The fact that Thurman has already stated that he’s unwilling to fight Spence this year factors into my equation, as well. No. 9: Naoya Inoue “The Monster” is scheduled for his bantamweight debut in May, against tough veteran Jamie McDonnell. Inoue has been the terror of the lowest weight classes. At 24, the best is still likely ahead for him. No. 8: Sergey Kovalev Since losing back-to-back fights against Andre Ward, Kovalev has knocked out two credible contenders in a row. I hope to see him in a true test later this year, against either Ukrainian Oleksandr Gvozdyk or Kyrgyzstan’s Dmitry Bivol. No. 7: Leo Santa Cruz Santa Cruz has developed from a relentless, over-powering and over-sized fighter at 118 and 122 pounds and has shown truly well-rounded skills at featherweight. He rematches with Abner Mares in June, who he beat majority decision in 2015, in a fight that I didn’t really think was close. Hopefully in the near future he fight a rubbermatch with Carl Frampton, who is responsible for his lone loss. No. 6: Wisaksil Wangek Last year Wangek beat former pound-for-pound king Roman Gonzalez in back-to-back fights–the second time by KO. Already in 2018 he has defeated elite talent Juan Francisco Estrada. He has a chance to be the greatest Western-style boxer ever from his native Thailand. No. 5: Mikey Garcia Garcia has now defeated top-level contenders from 126 through 140 pounds. If he’s willing to climb further, to 147 pounds, he should factor into some of the biggest fights of the next few years. No. 4: Vasyl Lomachenko The Ukrainian superstar has become a human highlight reel. He will fight top lightweight Jorge Linares in May. If he dominates that fight the way he has his other recent bouts, expect him to top a lot of pound-for-pound lists. No. 3: Saul Alvarez Canelo’s defensive footwork was a revelation last year against Gennady Golovkin. If his “tainted meat” issue gets resolved, his rematch with GGG will once more be the biggest fight of the year. No. 2: Gennady Golovkin Golovkin has been far less dominant in his past two fights. But he was facing Daniel Jacobs and Canelo, so that has to be taken into account. Still, it will be interesting to see how much he has aged when he finally gets back in the ring with Alvarez again. No. 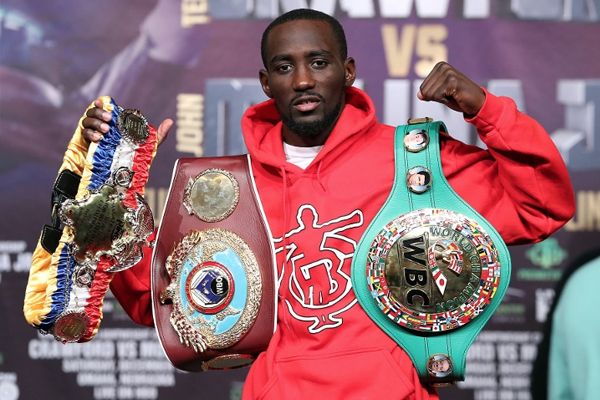 1: Terence Crawford Crawford was supposed to make his welterweight debut in April, against WBO belt-holder Jeff Horn. That’s been pushed back, due to a hand injury to Crawford. Horn’s camp has been quick to call Crawford soft. Expect the Australian to learn the hard way that there is little to be gained in trash-talking Crawford, who has an old-school mean streak.